Northern Bound Books creates unique hand bound books and notepads. Each of the books uses quality leather and 80lb linen paper. Designs on the covers and notepads are created with hand carved stamps and ink. Some books are made in miniature to be worn as jewelry - earrings and necklaces. I create unique open spine construction hand made journals. I use fine quality hand made papers or fabric for the covers. I use linen hinge tape inside the spine, acid free binder's board (cut to size & sanded) for the covers & spine pieces. I use good quality writing paper for the book block. I hand sew each book with linen book thread, ribbon or sinew. I also incorporate found objects, geometric designs in paper, or vintage postcards as a part of the book cover design by gluing or sewing them in place. The hand made books that I lovingly create are a wonderful expression of how color, design, paper, fabric and reclaimed items can be assembled into a tangible touchable unfinished work of art...until it is discovered by someone who will fill the pages between the covers and finish what I have started, a beautiful useful work of art. A self-taught collage artist from Minneapolis this high-density collage style begins with a hand drawn sketch covered by layers and layers of paper from recycled magazines, thrift store children’s books, and found objects. Each original is uniquely three-dimensional and takes anywhere from 40 to 140 hours to complete. Along with paper the artist uses beads, stickers, string, gems, and anything else found buried in her craft bin created by over ten years of scrapbooking and card-making. The artist followed her passion of artistry in 2014 after three years of helping folks with disabilities find employment they loved. She continues to work for non-profits but now spends evenings creating her textured and intricate collages and learning woodshop skills to build frames. Her 4x6 greeting cards have turned into 12x18’s and then 20x24’s. Her largest one to date being over four feet across and taking almost 200 hours of work. Andrea Martin is an award winning local artist and papercutter. She received her BA in biology from Indiana University and studied art at the Maryland Institute College of Art. 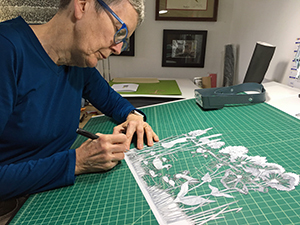 She has been cutting paper for about 7 years and started working as a full time artist after retiring from teaching science. Andrea exhibits her work at art fairs and exhibitions in the Twin Cities, as well as nationally and internationally. In addition, her work was featured on the Twin Cities Public Television series Minnesota Original. Andrea uses cut paper to create nature scenes that explore the interactions of plants, animals, and humans in the urban landscape. Each design is cut from one piece of paper using an x-acto knife. Sometimes multiple layers of colored paper are used to enhance the design. Hand-cut paper designs. I start by drawing a design on a piece of paper, which I then hand-cut using an x-acto knife. Sometimes I add color to the design by adding several layers of colored paper, paint or ink.